Okay, this one is gonna be a bit of a love fest. 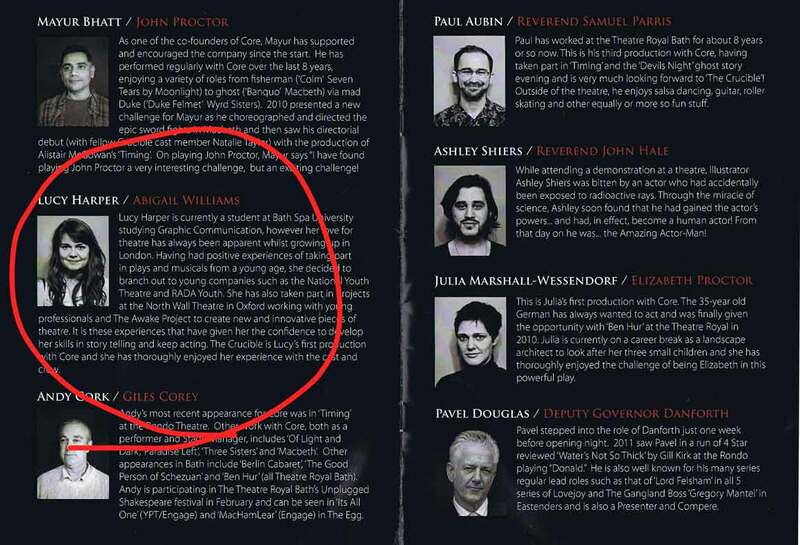 Yep, last night, courtesy of a very nice, young boyfriend, I was lucky enough to be bought the last ticket for the Core Theatre production of The Crucible at the Rondo Theatre in Bath. Firstly I would like to say what a massive amount of respect I have for the whole cast and crew for their hard work on this. It seems incredible to think that the people on and behind that stage had done so in addition to their everyday lives and jobs, and the performance I saw was a true testament to their passion and dedication to it. Every single person on that stage did a magnificent job in engaging, not only me, but the whole audience in the darkness of Arthur Miller’s story and, while this is a bit of a favouritism post for my buddy, I feel it’s important to point out that she was by no means the only talent to astound me that night. But she is a bit of a sneaky one is Lucy Harper. We all knew from her work at university that she has an incredible talent for all things creative, and assumed that it manifested itself best in illustration but, I kid you not, last night, on that stage, she blew my socks off. Lucy played Abigail; a big role and a kind of a catalyst for the whole show, and she did so with professionalism and skill that seemed to me to surpass many seasoned actors. I’ll attempt to illustrate this point by telling you that one week ago, Lu fractured her elbow in multiple places and STILL managed to deliver an incredible performance. Incredible to the point that the sling became invisible, not only to me (who’s sort of used to it) but to the chatty old ladies in the foyer afterwards whose praise I took great pride in overhearing. It seems a little unfair to me, when so many people struggle to find even one talent that they can truly nurture into something special, that Lucy is happily sitting on (at least) two. From now on I am well and truly keeping a sneeky eye on that girl. It will take you to a real life, actual review in which my little matey is mentioned YET AGAIN with regard to being just a little bit excellent. And I can’t stress anough quite how deserved that is. Okay I’m wondering if that’s enough praise to sufficiently embarrass her. No? Well okay, one more. Look how pretty she is in the programme! Yeah, that’s definitely enough now. I worry anymore would go to her head, you know what these actor types are like. Seriously Lu, big love to you and your funny little wonky arm. I’m so proud that you saw it through at a time when many other people would have, completely understandably, thrown in the towel. You are fearless and talented and this is a truly phenomenal combination.